As in other oil seeds, flax too is one of the very high-calorie dense foods. 100 g of seeds carry 534 calories or 27% of daily-required levels. Further, the seeds are an excellent source of numerous health-benefiting nutrients, dietary fiber (mucilage), minerals, antioxidants and vitamins that are essential for optimum health. Flax seed is rich in monounsaturated fatty acids like oleic acid. It is also one of the top plant sources ofomega-3 essential fatty acids such as linoleic acid, alpha-linolenic acid (ALA) and arachidonic acids. Regular intake of small portions of flax seeds in the diet helps to lower total as well as LDL or “bad cholesterol” and increases HDL or “good cholesterol” levels in the blood. Research studies suggest that Mediterranean diet that is rich in fiber, monounsaturated fatty acids and omega-3 fatty acids help to prevent coronary artery disease and stroke risks through favoring healthy blood lipid profile. 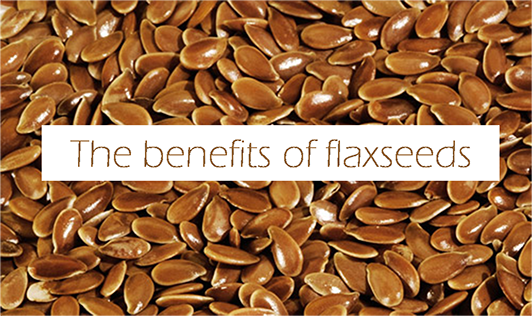 Flax seeds are perhaps one of the most widely available botanical sources of n-3 or omega-3 fatty acids. Flax seed oil consists of approximately 55% ALA (a-linolenic acid). One spoonful of flax seed oil provides about 8 g of omega-3 fatty acids. Research studies have suggested that n-3 fatty acids by their virtue of anti-inflammatory action may help lower the risk of blood pressure, coronary artery disease, strokes and breast, colon and prostate cancers. Adequate omega-3 levels are required for overall development and maturation of nervous system in infants. The seeds contain lignans, a class of phytoestrogens considered to have antioxidant and cancer preventing properties. Flax are an excellent source of vitamin E, especially rich in gamma-tocopherol; containing about 20 g (133% of daily-recommended values) per 100 g. vitamin E is a powerful lipid soluble antioxidant, required for maintaining the integrity of cell membrane of mucusa and skin by protecting it from harmful oxygen-free radicals. The seeds are packed with many important B-complex groups of vitamins such as riboflavin, niacin, thiamin,pantothenic acid, vitamin B-6, and folates. Thiamin is an essential co-factor for carbohydrate metabolism and helps prevent beri-beri disease. Folates help prevent neural tube defects in the fetus when consumed during pre-conception period and pregnancy. Flax or linseed oil has flavorful nutty aroma and has been used in cooking, and as “carrier" or "base oil” in traditional medicines and in pharmaceutical uses.